ECSTASY, PASSION AND PAIN-ECSTASY, PASSION AND PAIN. The maxim that Good Things Don’t Last Forever proved to be true for Ecstasy, Passion and Pain. They released just one album, Ecstasy, Passion and Pain in 1974. Featuring just ten songs, Ecstasy, Passion and Pain was a tantalizing taste of what might have become for Barbara Roy’s group. The lineup featured a rhythm section of guitarist Jimmy Clark, bassist Joseph Williams and drummer Althea “Cookie” Smith, plus percussionist Carl Jordan and keyboardist Ronnie Foster. Barbara Roy sang lead vocals and was the voice of Ecstasy, Passion and Pain. On the release of their debut album Ecstasy, Passion and Pain they looked to have a great future ahead of them. With Philly Soul and disco about to dominate the seventies, their 1974 debut album couldn’t have been released at a better time. Joining Ecstasy, Passion and Pain for the recording of their debut album, would be some of the most talented musicians of the time. The result would be Ecstasy, Passion and Pain, the one and only album from Barbara Roy’s innovative supergroup. Barbara Roy’s first introduction to the music business was recording a series of singles with her niece Brenda Gaskins, as Barbara and Brenda. The released singles that included 1963s Let’s Get Together released on Avanti, plus 1967s If I’m Hurt You’ll Feel the Pain and Never Love A Robin on Dynamo Records. After her niece Brenda retired from music, Barbara played guitar for Inez and Charlie Fox. Barbara played on their biggest hit single, Mockingbird. Session work and songwriting was how Barbara earned a living. That was until 1973, when Ecstasy, Passion and Pain were formed in 1973. Having formed Ecstasy, Passion and Pain, Barbara’s manager Phil Braxton got the group a recording contract with Roulette Records. Now that the deal was signed, work began on Ecstasy, Passion and Pain’s debut album, Ecstasy, Passion and Pain. For Ecstasy, Passion and Pain, Barbara penned seven of the ten songs under her real name, Barbara Gaskins. These were Ask Me, Let’s Love. I Wouldn’t Give You Up, I’ll Take The Blame, Try To Believe Me, Don’t Burn Your Bridges Behind You and Born To Lose You. The songwriting team of Norman Harris, Allan Felder and Bunny Sigler penned two tracks, Somebody’s Loving You and Good Things Don’t Last Forever. I’ll Do Anything For You was written by Melvin and Mervin Steals, fresh from the success of their million-selling single Could It Be I’m Falling In Love, which gave The Detroit Spinners a number one single. These tent tracks became Ecstasy, Passion and Pain, which was recorded at Philly’s Sigma Sound Studios, with an all-star band. Accompanying Ecstasy, Passion and Pain for the recording of Ecstasy, Passion and Pain at Philly’s Sigma Sound Studios were the classic lineup Philadelphia International Records’ legendary house-band M.F.S.B. This included the Baker, Harris, Young rhythm section and guitarists Bobby “Electronic” Eli and Roland Chambers. Vince Montana Jr, played vibes, Larry Washington percussion and keyboards came courtesy of Lenny Pakula and Ron “Have Mercy” Kersey. They were joined by Don Renaldo’s Strings and Horns, plus backing vocalists The Sweethearts of Sigma, Barbara Ingram, Carla Benson and Evette Benton. Arranging, conducting and producing Ecstasy, Passion and Pain was the legendary Bobby Martin. Once the recording of Ecstasy, Passion and Pain was completed, it was released in 1974. On the release of Ecstasy, Passion and Pain in 1974, the album reached number thirty-eight in the US R&B Charts. I Wouldn’t Give You Up was the lead single, released in 1974, reaching number seventeen in the US R&B Charts. Ask Me then reached number fifty-two in the US Billboard 100, number nineteen in the US R&B Charts, number four in the US Disco Singles Charts and number two in the US Dance Music/Club Play Charts. Ecstasy, Passion and Pain’s debut album Ecstasy, Passion and Pain had proved a commercial success. However, little did anyone realize that there would be no followup to Ecstasy, Passion and Pain. This would be a missed opportunity, as you’ll realize, when I tell you about Ecstasy, Passion and Pain. Opening Ecstasy, Passion and Pain is Ask Me, one of six tracks lead singer Barbara Roy wrote, under her real name Barbara Gaskins. Just a moody Baker, Harris, Young rhythm section give way to swathes of lush strings, growling horns and Hammond organ. Straight away, Barbara’s strident, joyous vocal takes charge Power and passion are combined, while The Sweethearts of Sigma urgently answer her call. Meanwhile, Baker, Harris, Young provide the track’s pulsating heartbeat. Ron Baker’s bass helps drive the arrangement along, as strings dance and horns growl. Throughout the track, Barbara’s powerful, pleading vocal is at the heart of the track’s success, holding you in its spell. The tempo drops on Let’s Love. Just an understated rhythm section, Vince Montana Jr’s vibes and lush strings sweep slowly. When Barbara’s vocal enters, it’s tender and thoughtful. Immediately, the arrangement and vocal become one. Cooing, sweeping harmonies from The Sweethearts accompany her. Later, they grow in power, urgency and soulfulness, matching Barbara every step of the way. They taking their signal from Baker, Harris, Young. The Sweethearts of Sigma and M.F.S.B. provide the perfect accompaniment for Barbara, as she delivers a tender, beautiful and emotive vocal Magnus Opus. I Wouldn’t Give You Up sees Ecstasy, Passion and Pain and M.F.S.B. kick loose. The tempo increases from the get-go. Larry Washington’s percussion and congas are joined by Baker, Harris, Young, growling horns, keyboards and cascading strings. Together, they ensure the arrangement bursts into life. Soon, Barbara climbs onboard. Her vocal is urgent, defiant and confident, with The Sweethearts of Sigma adding soaring harmonies. Meanwhile, Norman Harris’ chiming guitar, Earl Young’s pounding drums and Don Renaldo’s dancing strings combine to create an arrangement that straddles the sixties and seventies in sound and influence. Having said that, it’s a hook-laden track, driving, dance-floor friendly track. Just Ron Baker’s bass and sweeping swirling strings combine as I’ll Take The Blame unfolds. A burst of Earl Young’s drums injects a sense of urgency. It also acts as your signal to pay attention, as Barbara unleashes a soul-baring vocal. Her voice fills with emotion and hurt, as tender harmonies from The Sweethearts of Sigma enter. They’re joined by sweeping, swirling strings, bursts of dramatic drums and a prowling bass. An added bonus is melancholy guitar line. The longer the track progresses, the better Barbara’s vocal and The Sweethearts of Sigma’s sweeping, cooing harmonies get. Filled with emotion, sadness and heartache, they drive each other to greater heights, resulting in a heartachingly beautiful, soul-baring song. Try To Believe Me closes Side One of Ecstasy, Passion and Pain. It has a tougher sound. Barbara’s vocal is fiery, sassy and powerful, while The Sweethearts of Sigma add cascading, gospel-tinged harmonies. For their part, M.F.S.B. combine elements of funk, Philly Soul and jazz. This means blazing horns, searing guitars and a sometimes, dramatic Baker, Harris, Young rhythm section. Both The Sweethearts of Sigma and M.F.S.B. play their part in setting the scene for Barbara’s fiery, sassy and strident vocal, which when it grabs your attention, just won’t let go. I’ll Do Anything For You opens Side Two of Ecstasy, Passion and Pain. It was written by Melvin and Mervin Steals, who had recently written the million selling Could It Be I’m Falling In Love for The Detroit Spinners. It seems the Steals’ brothers were on a roll. Straight away, two things strike you. This track has Philly Sound written all over it. The other is just how hook-laden a song it is. It’s like a slice of musical sunshine. The Baker, Harris, Young rhythm section join the lushest of dancing strings and keyboards, producing the mainstay of the arrangement. Barbara scats and The Sweethearts of Sigma add the sweetest, tenderest of harmonies. From there, the arrangement allows Barbara and The Sweethearts of Sigma to take centre-stage. Spurring each other on, they drive, cajole and encourage each other to deliver some of the most heartbeat, impassioned and emotive vocals and harmonies on Ecstasy, Passion and Pain. Waves of atmospheric Hammond organ, percussion and a broody bass open Don’t Burn Your Bridges Behind You. They join Barbara’s half-spoken sincere vocal. Then she scats, her vocal soulfully soaring, with just an understated arrangement accompanying her. Just Baker, Harris, Young with slow, lush strings and Vince Montana Jr’s vibes. Norman Harris’ adds a pensive guitar solo, while pizzicato strings and emotive, heartfelt harmonies from The Sweethearts of Sigma. By now, Barbara’s husky vocal is filled with emotion, veering towards gospel in her delivery. So moving, emotive and soulful is Barbara’s vocal, you’re spellbound and captivated. Somebody’s Loving You is the first of two Norman Harris, Allan Felder and Bunny Sigler penned tracks. Piano and Baker, Harris, Young combine with rasping horns and dancing strings to drive the arrangement along. Barbara’s vocal is urgent and filled with hurt and heartache. Sensing this is one of Barbara’s best vocals, The Sweethearts of Sigma add dramatic, urgent soaring harmonies. Lush strings float above the arrangement, while the rhythm section, keyboards and harmonies inject urgency and drama. While Barbara displays her considerable vocal prowess, Norman Harris, Allan Felder and Bunny Sigler demonstrate just how talented a songwriting team they were. Born To Lose You is the last of seven tracks Barbara wrote for Ecstasy, Passion and Pain. It’s another slow song, with an understated arrangement. Just a meandering bass, atmospheric Hammond organ and bursts of dramatic drums combine. They set the scene for Barbara’s heartbroken, hurt-filled vocal. She lays bare her hurt, sounding rueful, wistful and melancholy. The Sweethearts of Sigma add tender, sweeping harmonies, as if wanting to sooth Barbara’s hurt. Meanwhile, the arrangement veers between understated to dramatic. String frantically sweep and swirl, drums pound and horns rasp. This is the perfect accompaniment for one of Barbara’s most moving, emotive and hurt-filled vocals. Good Things Don’t Last Forever, closes Ecstasy, Passion and Pain. It’s the second Norman Harris, Allan Felder and Bunny Sigler penned track. Just like I’ll Do Anything For You, this delicious slice of Philly Soul grabs your attention and won’t let go. From the opening bars, the track bursts into life. Strings cascade, their lush sound accompanied by growling horns, chiming guitars and Baker, Harris, Young who provide the track’s pulsating heartbeat. Spurred on By M.F.S.B, Barbara unleashes a wistful vocal, where power and passion combine. Matching her every step of the way are The Sweethearts of Sigma. They add soaring, cascading vocals. By now, Ecstasy, Passion and Pain, M.F.S.B. and The Sweethearts of Sigma are in the groove, determined to bring Ecstasy, Passion and Pain to a memorable high. This they do, mixing Philly Soul and disco seamlessly. 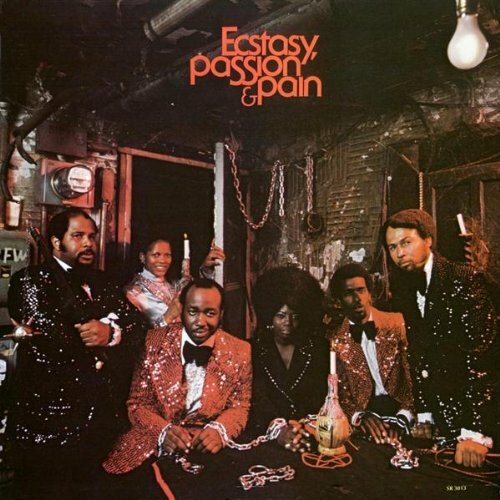 Released in 1974, Ecstasy, Passion and Pain sees Ecstasy, Passion and Pain fuse Philly Soul and disco, with elements of jazz and funk Over ten tracks, seven penned by lead singer Barbara Roy. In some ways, Ecstasy, Passion and Pain is a tantalizing taste of what might have been. Ecstasy, Passion and Pain was their only album. Granted they released a few more singles and enjoyed chart success during the seventies. Singles like 1975s One Beautiful Day and 1976s Touch and Go gave Ecstasy, Passion and Pain top ten singles in the US Disco Charts. Further singles were released on Roulette, including 1976s Passion and 1977s Dance The Night Away. By then, the lineup of Ecstasy, Passion and Pain had changed. One constant was Barbara Roy. Ecstasy, Passion and Pain was her group after all. Following 1977s Dance The Night Away, 1981 saw the release of If You Want Me on Barbara’s Roy B Records. By then, disco was no longer King. It was the post-disco age, after all. Disco had to evolve and reinvent itself, with boogie picking up the baton from disco. However, during the disco age, Ecstasy, Passion and Pain were one of the genre’s success stories. Similarly, so was their only album, 1974s Ecstasy, Passion and Pain. Sadly, Ecstasy, Passion and Pain was the only album Ecstasy, Passion and Pain released. Who knows what might have happened if they’d released further albums? Listening to Ecstasy, Passion and Pain, they weren’t wanting when it came to talent. Especially with M.F.S.B. providing the musical backdrop, The Sweethearts of Sigma adding their deliciously soulful harmonies and of course, Bobby Martin arranging and producing Ecstasy, Passion and Pain. Although Ecstasy, Passion and Pain contained just ten songs, from the opening bars to the closing notes, it’s a deliciously soulful and often, dance-floor friendly album, with Barbara Roy’s vocal key to Ecstasy, Passion and Pain’s sound and success. For anyone yet to discover the Philly Soul and disco of Ecstasy, Passion and Pain, then a veritable musical treat is in-store for you. Standout Tracks: Let’s Love, I’ll Take The Blame, I’ll Do Anything For You and Somebody’s Loving You. ← DUSTY SPRINGFIELD-A BRAND NEW ME.